You’re a difference maker. You started your business to make a difference to the people you can help. And while you know you need to market & sell your wares to pay your bills, you hate the idea of being a pushy, sleazy salesperson. “When I grow up, I want to be a salesperson!” said no one ever. Icky self promotion is no one’s idea of a dream marketing system. 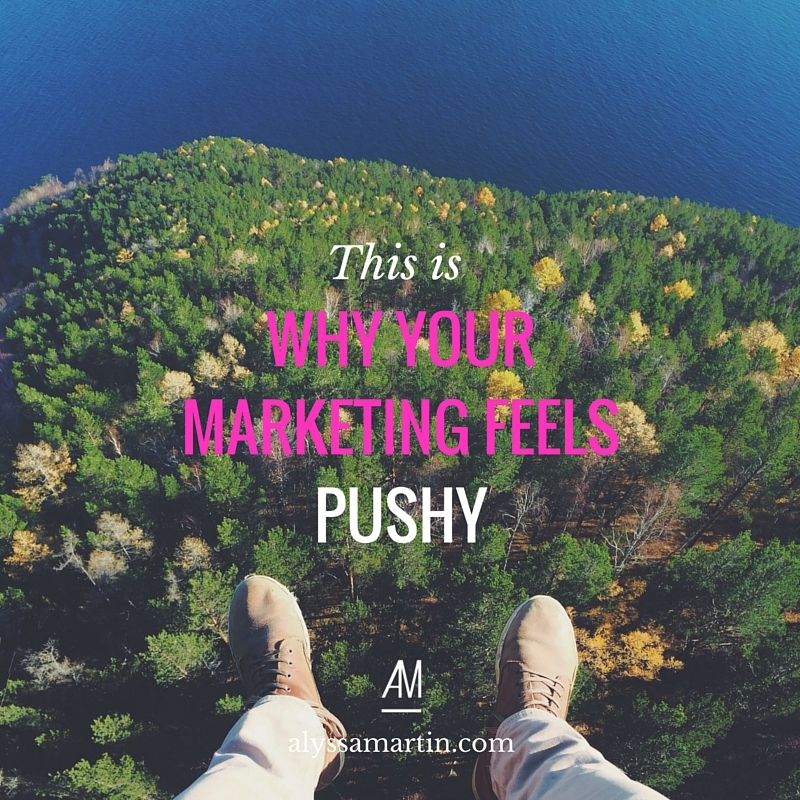 So how do you market your business without feeling pushy? For centuries, the greatest marketer or salesperson was someone who knew his product (or service) inside out and could persuade someone who knew nothing about the product (the ignorant buyer) that it could solve a problem that the buyer didn’t even know they had. Umm… eskimos don’t need ice, buddy. That shiz has been going on for centuries and we’ve all caught on to the saleman’s game now. We’re hyper aware of the tricks of the trade. We haaaaate being sold to. We’re too cynical for the same old tactics to work on us. We’re sick of having things pushed on us & just want someone to LISTEN to us. You’re assuming your dream client knows something that they don’t. Your entire marketing strategy rests on your dream client’s awareness of their problem. Your offer is secondary to the client’s perception of their problem. You MUST know their level of awareness. You’ve got to meet your clients where they’re at. Then you help them get where they want to be. If you assume they’re somewhere they’re not, your marketing begins to feel pushy. If you misunderstand their level of awareness, you’re talking into the wind. They won’t hear you, no matter how much you try to convince them. Trying harder won’t turn them into converts. It’ll make them want to run away from your pushy self. You’re someone who wants to work with clients in a win-win scenario where you both get a lot of value & satisfaction out of the business relationship. You want it to feel good. But it doesn’t feel good to your potential client when you don’t know your their level of awareness & you think they’re better / faster / different than they really are. That’s when your client begins to feel like you’re being pushy. Imagine you’re marketing gum that helps people quit smoking. And imagine you’ve found a magic time travelling portal & you’re talking to Jane from 1960. In 1960, smoking was all the rage. There was hardly any evidence to suggest that smoking would be harmful – it was just plain cool, ok Mum! In other words, Jane have a very different mindset & perspective about smoking than you do. Jane has zero awareness that her cigarette habit is a problem that needs solving. But you happen to know all the important, scientific information that we know now. Smoking = bad. You can’t simply assume that 1960s Jane will believe you, especially not when everything else she hears contradicts your message. You: Check out my gum that’ll help you easily quit smoking without the withdrawal symptoms! 1960s Jane: Quit smoking? Why would I want to do that? You: Smoking is bad for you. You’ll feel so much better if you quit. Trust me! You could then turn to your fancy pants science and try to tell her what smoking does to her lungs or how it makes her age faster… but you’ve got her awareness level wrong, so now you’re just trying to force her to see your perspective. You’re now coming off pushy. You tried to capture her attention with the wrong thing (“this will help you quit smoking”), so she quickly lost interest. When you keep trying to persuade her, you turn into that pushy sales person you hate. Meet them where they are, then guide them towards the realisation that your product or service will genuinely help them. You can’t force them to believe you. But you can guide them. She probably would’ve said yes & then you could’ve started explaining to her how her cigarettes are making her age faster. You could acknowledge that her “little smoking habit” may seem harmless, but there’s lots of damage it’s actually doing to her body behind the scenes. Now, you’re having a conversation and moving her from completely unaware to problem aware. Then, you can take steps to get her from problem aware to solution aware. Once she’s at that level of awareness, she knows she the results she wants, but not that your quit-smking gum product offers it. Next, you can start to introduce her to your product and all the ways it will benefit her. And that starts with getting to know your dream client & meeting them where they’re at.